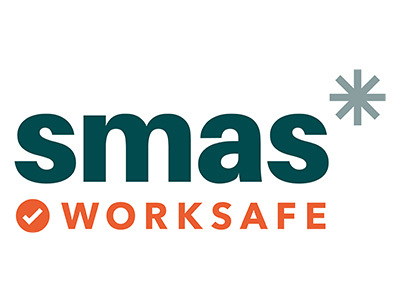 Summary: Supply, and installation of steel sheet piles to form a watertight part basement. 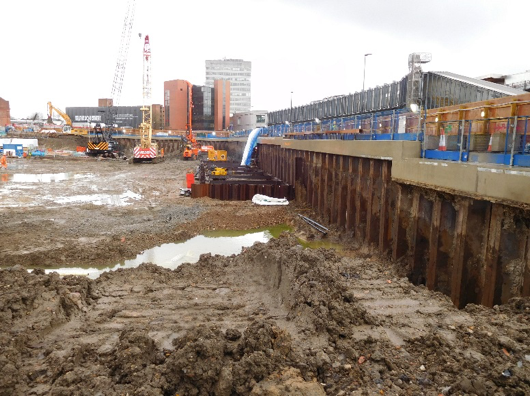 Sheet Piling (UK) Ltd were employed by Westfield Europe Ltd for the ‘Design, Supply & Installation’ of sheet piles, to form a permanent basement as part of a new high end Shopping centre development in White City, London. Working closely with the Design Team during the design development stages of the project, it was concluded in areas within close proximity to the London Underground the sheet piles should be installed using a Giken Pile Pressing method, this method is silent & vibrationless and consequently is particularly suited for projects that are in close proximity to existing structures. 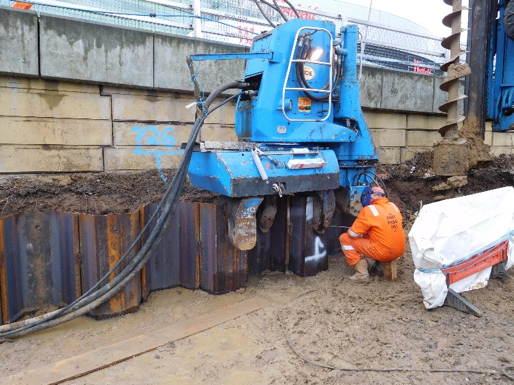 Whereas, in areas that were remote from the London Underground Structures, a ABI 13/16 Telescopic Leader Rig with a leader mounted vibratory hammer was selected for its increased productivity over a Giken pile press, this increase in productivity was required in order to meet the deadlines set by Westfield London Ltd.
Sheet Piling (UK) Ltd consequently proposed a solution using both ‘U’ and ‘Z’ section sheet pile, this solution involved installing the ‘Z’ section sheet piles using the Telescopic Leader Rig, but in areas where the Giken was requires to install the sheet piles, the section was changed to ‘U’ Section Sheet Piles for their superior drivability properties. 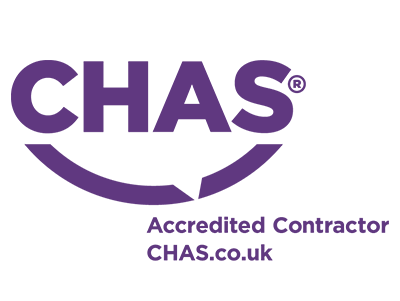 In areas of the project where pile pressing installation was required, the ground had to be pre augured prior to installation. This pre-auguring was required in order to prevent the piles from refusing prior to the design pile toe level being achieved, as the pre-auguring loosens the River Terrace Gravels allowing the pile to push through the material with less force. 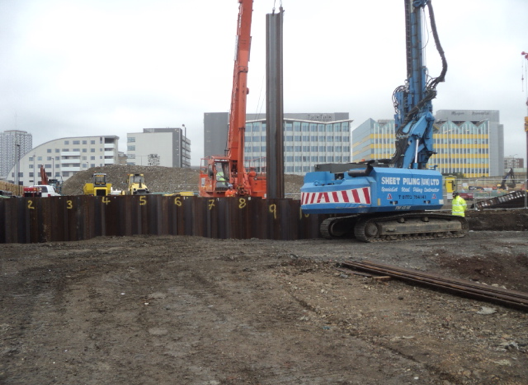 The benefit of the ‘Z’ section sheet piles installation was to take advantage of the highly efficient structural properties to mass of the sheet pile section, allowing for an overall cost saving throughout the project. By utilising this ‘Value Engineering’ solution of being able to install ‘Z’ section sheet piles in pairs, with an ABI Double Jaw Clamp, using a Vibratory installation method; Sheet Piling (UK) Ltd were able to provide a highly efficient solution which not only had considerable cost savings on materials but also satisfies all parties deadlines. For further cost saving on the project, the majority of the installation involved the piles being installed in a cantilever solution in order to remove the need for propping in the temporary state, although in areas where deep pile cap excavations were required, temporary hydraulic props were installed as a full cantilever solution was not viable. 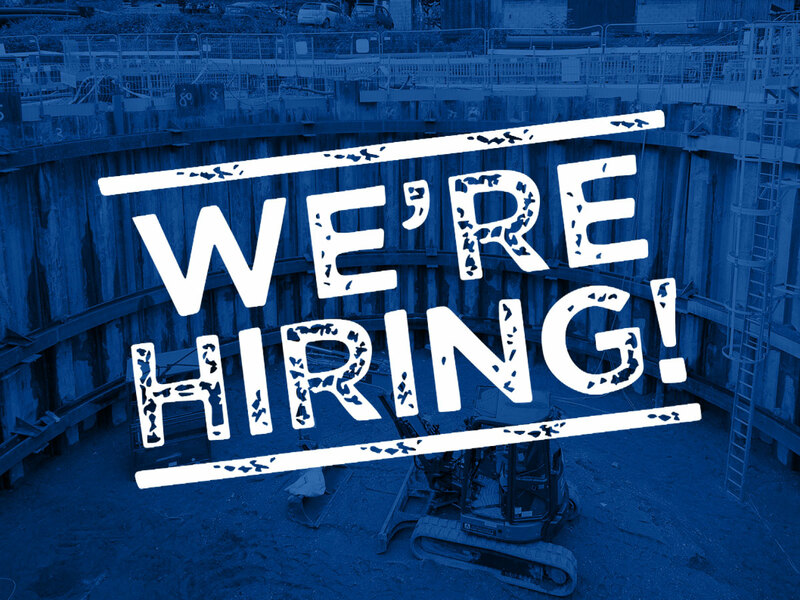 Sheet Piling (UK) Ltd are the only sheet piling contractor in the UK who can offer a one-stop solution for such projects utilising our own extensive stock of Emirates Steel ‘Z’ Pile Sections together with our fleet of Telescopic Piling Rigs and Giken Pile Presses. In total 616.2 Linear meters of sheet piling was installed using a selection of different pile sections, these sections were; Emirates Steel EZ18-630, Arcelor Mittal AZ26-700, Arcelor Mittal GU23 and Arcelor Mittal GU18 sheet piles which all ranged in length between 7.0m and 12.0m. with the majority of the project utilising our stock of EZ18-630 Sheet Piles. Finally to complete the works, the exposed sheet pile interlocks were welded using a Lloyd’s Accredited Welding Procedure to provide a 100% watertight basement to BS8102:Part2:2009 all of which works is fully warrantied by Sheet Piling (UK) Ltd.